Pacesetters Athletic Club: Help support Literacy and have fun in this run! 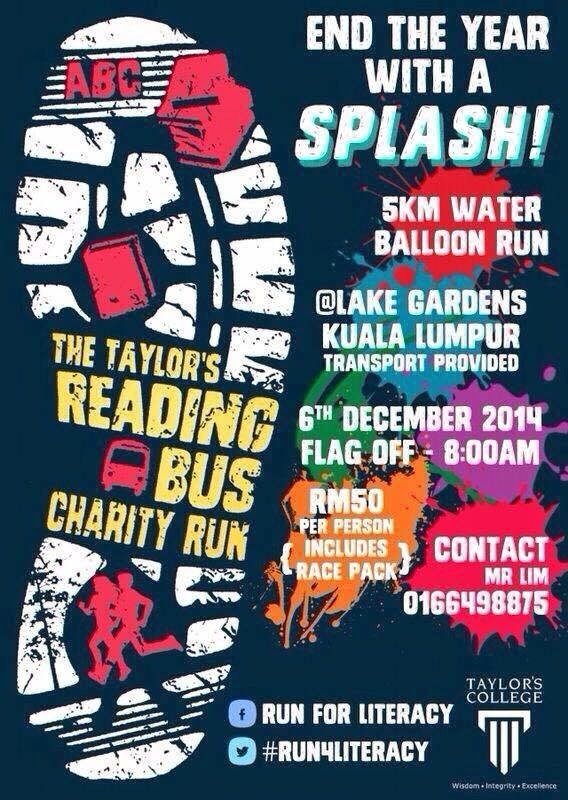 The project that the Taylor`s Reading Bus 2014 will be launching this year is the Charity Run which will be held on the 6TH December 2014 . The venue of the Charity Run will be at The Perdana Botanical Garden (formerly known as Lake Gardens Kuala Lumpur). Lake Gardens is our choice of venue because it’s one of the most strategic place to have a run in Kuala Lumpur while enabling us to capture the attention of the public. We aim to generate interest from teenagers, college or university students and young adults. The main reason of having this charity event is to raise awareness on illiteracy as it has been increasing rapidly among underprivileged children in Malaysia throughout the years. We aim to help control of the rate of illiteracy problems that have caused a decrease in the country’s productivity. Instead of just running campaigns and collecting donations from relatives and friends, we planned to have a charity run because we hope to get the public’s attention to educate them on the importance of education. Based on our online and public surveys, most of those from the said target group prefer outdoor events such as a Charity Run. We would also like to make a huge impact to spread awareness about the lack of educational resources provided to children from low income families. Moreover participants will also be given a T-shirt during the run that will have the hash tag #RUN4LITERACY and gold level sponsors’ logo printed on the shirts for publicity and to remind the participants that they are contributing to a better education for the underprivileged children. Transportation : Free transportation is only provided to and from Taylor's College Subang Jaya and Taylor's Lakeside University.